In the exploding world of start-ups, rising Indian companies have found a new ally: the Nexus Incubator. The innovative programme, a collaboration between the American Center, New Delhi and the IC2 Institute at The University of Texas at Austin, uses an international perspective to help entrepreneurs in India bring their ideas to life and to the market. Nexus start-ups work on a variety of environmental issues, including energy consumption and sustainable agriculture, water pollution and greenhouse gas emissions. “When we work with promising new start-ups, we try to teach them the best ways to run their businesses through entrepreneurship and innovation,” says Erik Azulay, the incubator’s director. The incubator provides carefully-selected “cohorts” of Indian start-up companies with tools, resources, education and anything else that they need to evolve from intriguing ideas into powerful, sustainable businesses. Specific programmes for incubator participants could include classes on marketing and market-based research or workshops on finance and fundraising, courses on dealing with partner organisations or one-on-one mentorship sessions with renowned business experts from the US and India. “We try to get them funding, customers and increased revenue. We are helping build internationally-reaching businesses in a wide array of fields, and this promotes international cooperation as well as business success,” says Azulay. Significant players in the world of Indian business have been brought in as official partners of Nexus. These include the investor group Indian Angel Network, the Indian School of Business, tax and advisory firm Grant Thornton India, the American Chamber of Commerce in India, the Federation of Indian Chambers of Commerce and Industry, and more. Rising companies nurtured through the incubator are hugely diverse in technology and mission. For instance, while Morphedo is an online 3D printing service platform that lets companies build quick and affordable prototypes, Dhakka Brakes’ technology improves the safety and stability of the millions of cycle rickshaws in India. Agpulse Organics is an organic pesticide developer whereas S4S Technologies is a food preservation technology innovator. Although Nexus is a young programme, its inception was fortuitously timed, as India is in the midst of a period of remarkable growth and increased focus on entrepreneurship, according to Azulay. Agpulse Organics uses organic and low-impact botanical Ayurvedic ingredients to help farmers thrive without hurting the environment. 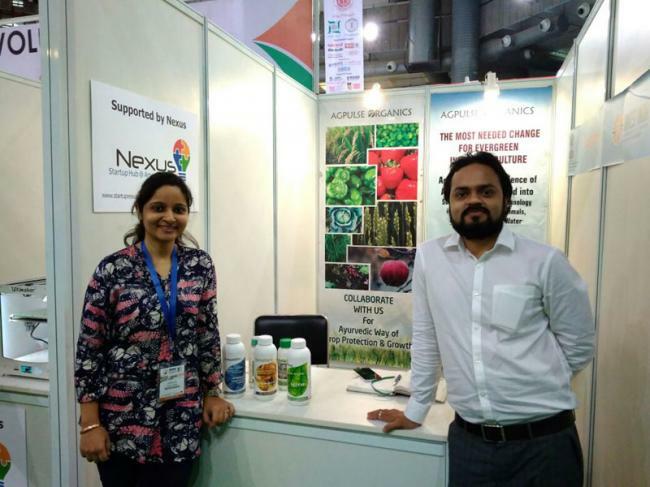 Their products include environment-friendly pesticides and supplements, neem manure and plant growth promoters. “Healthy food and nutrition security are key factors in sustainable development goals, which are crucial for [preserving] flora, fauna, underground water, aquatics, livestock and human health,” he says. Ranjan expects that his company’s innovations would help reduce the greenhouse gases created regularly due to the mass production of synthetic pesticides. Poisoning animals, clogging rivers and polluting oceans, plastic waste presents a formidable environmental challenge—one that Rays Enserv of Punjab is working hard to solve. Rays Enserv takes end-of-life plastics—the plastics that can’t be recycled anymore—and creates diesel fuel from them. Although the technology of turning discarded plastic into oil isn’t really new, nobody has yet made it work on a scale that makes sense, both financially and ecologically, says Azulay. Rays Enserv is about to launch their first industrial plant in India. They’ve found a steady, constant supply of suitable plastic industrial waste from the North, which could really have a huge environmental, social and economic impact. Ashok Bijalwan, who co-founded Rays Enserv with his colleagues Yash Jain, Ashok Suyal, Sanjeev Sharma and Ishan Jain, is proud of the impact his company is poised to make. He sees the technology helping lessen greenhouse gas emissions associated with dumping of plastic in landfills, reducing toxic gases created by burning plastic waste and creating a cleaner and greener alternative to standard fossil fuels. Rice parboiling is a traditional practice followed in the eastern, central and southern parts of India. “Though the parboiling practice has immense advantages in terms of extra shelf life and nutrition-enriched food, it consumes lots of fuelwood in the post-harvest process and creates stress on the forests close to the villages,” says Krishna Kant of Saral Usna, Jharkhand. This is a challenge that Kant and his colleagues address with their technology: a new type of parboiler, made from reused steel barrels, which dramatically saves resources, time and energy. “Saral Usna’s rice parboiling technology reduces fuelwood consumption by 40 percent and it can be further reduced by the use of leaf litter. The use of leaf litter collected from the nearby forests also reduces the risk of forest fire,” says Kant. 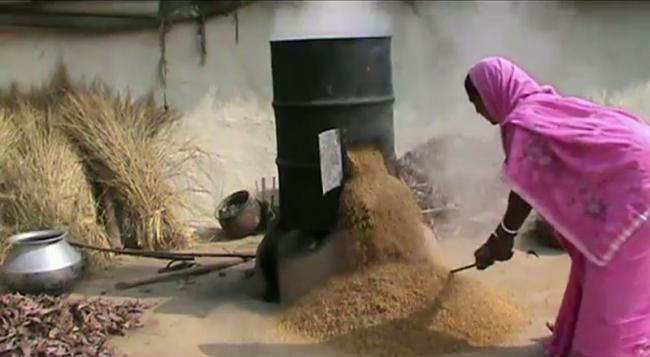 Kant points out that Saral Usna also protects rice grain from breakage during the parboiling process, reducing the amount of damaged rice by more than 50 percent. Saral Usna began as a pilot programme under the Abhivyakti Foundation, an NGO founded by Kant focusing on prototyping the parboiler technology on a limited scale. Rural women love the Saral Usna product as it saves them hours of time and labour. At the same time, it’s a great technology for helping save wood and reduce deforestation.